Home › Medical › What’s in Your OTC Medication? What’s in Your OTC Medication? Over-the-counter (OTC) medicines are medicines that can be purchased at pharmacies or at general retailers without a doctor’s prescription. These drugs are used to treat mild and common ailments of varying nature. The production and sale of OTC medications have had a tremendous impact on the U.S. economy and the healthcare industry. In 2010, retailers profited over $17 billion from OTC drugs alone. According to a 2004 survey by Northwestern University, by using OTC medicines to treat upper respiratory infections (as opposed to using prescription drugs) the healthcare industry saves over $4.5 billion per year. In many ways, these OTC drugs are different from prescription drugs. 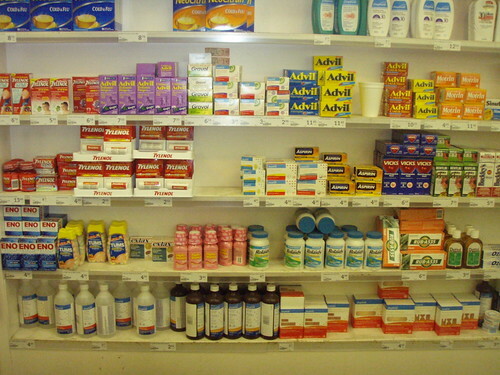 Over-the-counter medications sometime have similar ingredients to those of prescription drugs. With over 1,000 ingredients used, and over 100,000 different products, OTC medications are comprised of a lot of the same fundamental chemicals as prescription drugs. For example, Tylenol can be purchased over-the-counter, but doctors can write a prescription for it, too. The difference between the two is that the prescription dose is much higher; the active ingredient, acetaminophen, is much more highly concentrated in the prescription dose, making it have a stronger effect on the body. Other OTC drugs are offered at prescription strength, too, such as ibuprofen. Many classes of drugs are strictly not available over-the-counter. This list is long, but includes antibiotics, opioids, stimulants, depressants, and antidepressants. The reason these medications require a prescription varies depending on the specific medication. Some medicines are addictive, others need to be used sparingly (antibiotics). Physicians also want to ensure that individuals receive proper treatment for their sickness; in many cases, this can only be done by visiting a doctor or healthcare provider. Additionally, some medications are harmful to mix with others, and some medications have severe side-effects and increase an individual’s risk of acquiring another condition. By requiring prescriptions, physicians can closely monitor and regulate what their patients are taking, while providing high quality care confidently. Opioids are regulated as prescription-only because of their addictive nature. Common opioids include methadone, hydrocodone, morphine, and oxycodone. These drugs activate opioid receptors in the brain. Once triggered, these cells will release dopamine. Dopamine is part of the brain’s reward mechanism, critical for learning and forming habits. The brain can literally become addicted to these molecules, craving more and more after a certain level of tolerance has been acquired. This is how addiction begins. Physicians attempt to limit an individual’s likelihood of growing dependent by regulating the amount and length of time these medicines are administered. Over-the-counter pain relievers, such as ibuprofen, are typically non-steroidal anti-inflammatory drugs. These drugs, rather than acting on neurotransmitters, act on prostaglandins to limit inflammation throughout the body. The likelihood of addiction for these OTC drugs is very low. Using the right medicine combination, along with the right dosages and the right length of time, is very complex. It deserves the input of a medical professional. For common cold and flu symptoms, OTC medications are actually preferred. These medicines are comprised of antihistamines, which act by reducing swelling and vasodilation associated with cold and flu symptoms. Doctors have reported that over 10% of their office visits could have been avoided by using these OTC medications. Many OTC medicines are intended for symptom relief, not treatment. This is because physicians do not want patients attempting to treat themselves. Attempting to treat one’s self with powerful drugs is dangerous without the proper medical training.